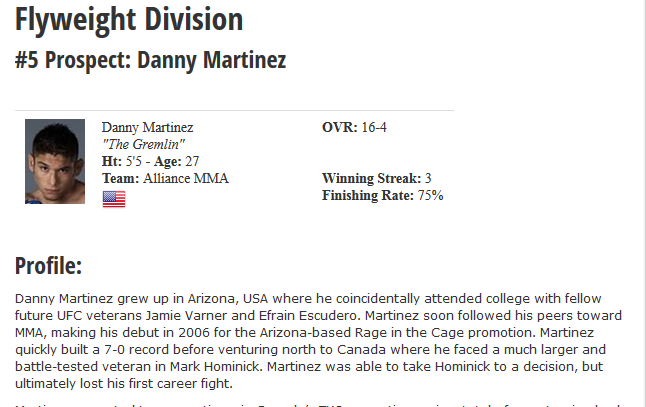 Danny Martinez grew up in Arizona, USA where he coincidentally attended college with fellow future UFC veterans Jamie Varner and Efrain Escudero. Martinez soon followed his peers toward MMA, making his debut in 2006 for the Arizona-based Rage in the Cage promotion. Martinez quickly built a 7-0 record before venturing north to Canada where he faced a much larger and battle-tested veteran in Mark Hominick. Martinez was able to take Hominick to a decision, but ultimately lost his first career fight. Martinez competed two more times in Canada’s TKO promotion, going 1-1, before returning back to the Arizona fight scene. Following 3 straight wins, Martinez was signed by the WEC in 2008. Martinez faced off against another debuting fighter, current UFC flyweight #1 contender Joseph Benavidez. Martinez was dominated throughout the fight, but showed a ton of heart absorbing Benavidez’s heavy strikes, and nearly scored a knockdown of his own in the final moments. Martinez ultimately lost via decision and was surprisingly not brought back to the WEC. Martinez’s career slowed down considerably as he only competed three times in the next 36 months. During that juncture, he lost to perennial #1 flyweight in the world Jussier Formiga. 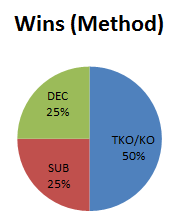 Martinez is currently riding a 3-fight win streak, but he has struggled to find fights. He has not competed since March of 2012. Martinez has settled in to Alliance MMA alongside training partner Dominick Cruz. Martinez once lived in the gym, hoping for a bigger opportunity. Martinez is a different fighter than Cruz as he is usually more aggressive and looking for the big punch. Martinez seems to be in a good position to get the call from the UFC should they ever expand their Flyweight Division beyond a dozen fighters. Martinez should be in the UFC right now. His only loss as a flyweight was to current UFC fighter Jussier Formiga. Otherwise, Martinez has fought above his natural weight class often, even competing against former UFC featherweight Mark Hominick. Martinez is a solid wrestler with power in his hands and is fully capable of being one of the powerhouses in the UFC Flyweight Division. His conditioning and ground game are still probably his weak spots, but as mentioned the only guys that have been able to exploit those holes are world class fighters. He should be able to hold up fine against lesser competition. Martinez hinted in prior interviews that he was on the UFC’s radar when they started up the flyweight division in 2012. Unfortunately, Martinez was never signed and has struggled to find suitable fights on the regional circuit.